Winter weather is wreaking havoc on us nationwide. Whether your running back and forth to the airport, commuting to work or getting the kids to the bus stop– it’s important to know what you can expect to see when you walk out the door. Don’t be caught off guard, get the latest and most accurate weather updates no matter where you are with these great apps. WeatherBug includes easy-to-use slide navigation, interactive maps, severe weather alerts and even lightening detection alerts. 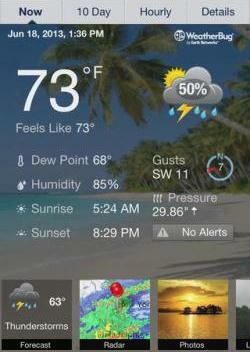 WeatherBug also claims to have the most accurate current, extended and hourly forecasts than other weather apps. Available on iOS and Android. For those that want a more global view of the current weather conditions, Living Earth will not disappoint. 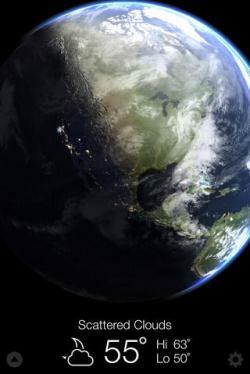 This app lets the user view live global cloud patterns, hurricanes and tropical storms. You can also explore weather dynamics on the planet with real-time 3D weather maps. Available oniOS. 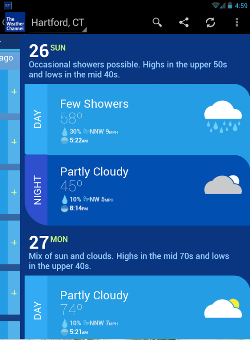 Available for both Android and iOS operation systems, AccuWeather includes unique features like calendar integration and social sharing functionality– meaning you can see what the weather will be like for your 2:oo appointment at that outdoor cafe. 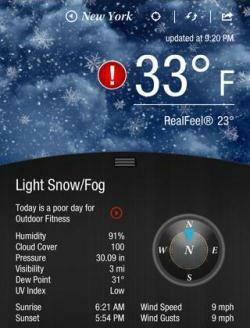 This app delivers accurate forecasts with a current weather conditions update every 15 minutes. The great thing about this app is that it gives you RealFeel® to tell you what it actually feels like outside, which could mean the difference between a delightful morning commute and a terrible start to your day. Available on iOS and Android. 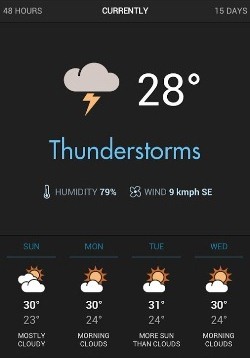 This app boasts the work of 200 meteorologists and the ultra-local TruPoint forecasting technology to provide the most comprehensive and accurate weather forecast possible. The Hurricane Central tab lets you track any tropical storm or full blown hurricane. You can also view videos from local forecasts to more general weather related topics. Available on iOS, Android and Blackberry. Eye in the Sky Weather app is perfect for those who like their weather reporting clean and simple. Four widgets and an expandable notification are available and highly customizable, giving you exactly what you want and nothing else. Available on Android. What are your favorite weather apps? Let us know below.